Here I am atop a table, posing for a photograph. I agree, I am cute! See Spot run, a book about my kind, but it’s not like that with us. We like to play and run and hide and leap and sit on our hind legs, as if we can pretend that being upright keeps us still. We wobble on our behinds, not set right for two-legged dancing. I need to alert you, dog lovers and silly non-dog lovers alike, this week is – give me a paw roll – National Dog Week. It’s a whole week dedicated to, who other, but me! National Zoey Week is during the last week of September and started 80 some years before I was born. The dog celebrators were awaiting my arrival on Dec. 20, 2008. Now that I’m here, it’s time to give your all to my week. * Put yourself in a dog’s paws: we like to be treated with respect and love with healthy dog food, coupled with treats and human food. * Play with us at least once a day: we need to keep in touch with our inner puppy. * Take us on walks: we need the exercise; we need to network through light pole and fire hydrant sniffing; and we need the fresh air. * Love us as if there’s no tomorrow: we may give you unconditional love, but it does come with some strings. We need to know that we’re your number one and that you’re our constant source of hugs, kisses, comfort and, yes, requited love. * Make sure we’re a member of your pack, so take us along whenever you can to dog-friendly stores, restaurants and coffee shops. We like to socialize as much as you – we might not only get pets from other people, we might meet another dog as a possible playmate. To sum up, it’s a dog’s life during this very important National Dog Week. But as far as I’m concerned, every week should be Dog Week. Or how about, it’s just a matter of another Dog Year. We get seven to your one. Here, Zoey hangs out atop Shelley's bed. She hides underneath the bed when she needs to pout. 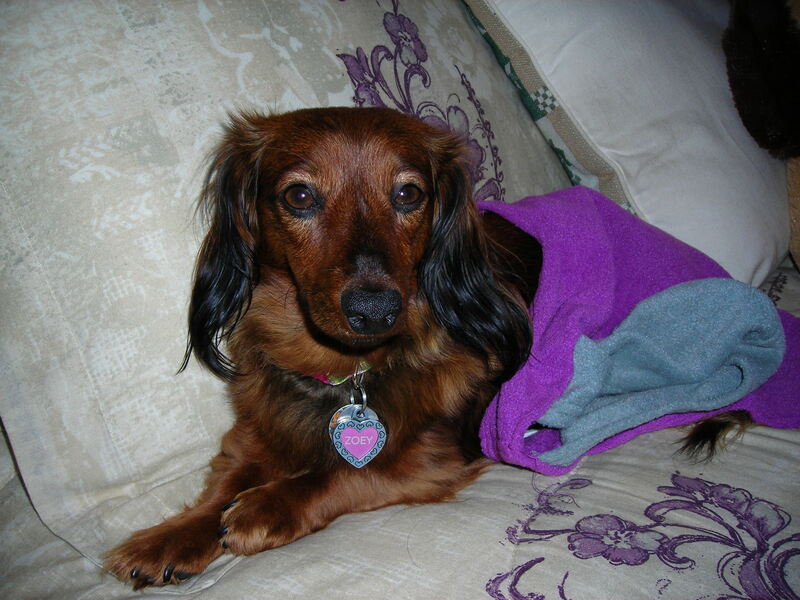 Zoey, my cute miniature dachshund, is not blogging this week. She’s under my bed pouting. For this reason, I thought I would speak on her behalf, since I can’t get her to come out and be sociable. 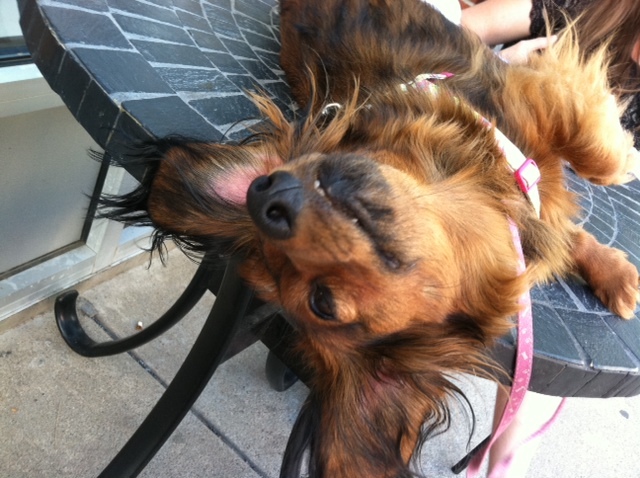 Almost every week, Zoey waxes poetic about her cuteness factor. I’ve noticed that, though Zoey is very cute and gets more attention than me, she has other qualities and skills worth noting. * For one, my dog is a great paper shredder. I give her my junk mail or whatever else needs ripping, and let her pounce. She grasps one side of the paper and makes a long tear, repeating the process until she is sitting in a pile of bite-sized pieces that I get to clean up. * My dog serves as my backup alarm clock. The trash and delivery vehicles that drive past my building come between 6 and 8 a.m., so I get a barking wake-up call. Aren’t I lucky? * My dog brings out my playful side. How can I remain serious when we play tug-of-war with a stuffed bunny or chase as she carries a stuffed chick equal to her size all over the apartment? * And my dog gives me kisses and attention without expecting anything in return, well except for food, her own dose of attention and lots of pets. Oh wait, there she is coming out from her hiding space. I guess she got over her pout about not getting attention while I worked on my writing. Maybe because I’m done and ready for some more play. I am cute and 100 percent confident about the fact that I am cute. I don’t need a cuteness contract to prove it. All I need to do is walk down the street. People want to stop and pet me. Or I just need to sit on my table at the Mandolin. Same thing, I get requests to be petted or photographed. I am a ham, relaxing on my table at the Mandolin.